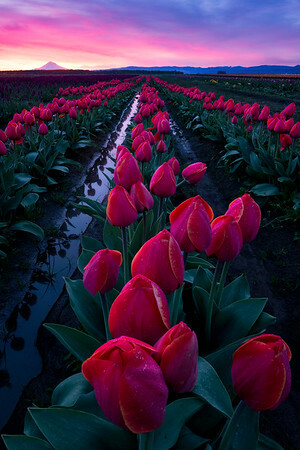 Having never been to Wooden Shoe before I wasn't quite sure what to expect as we drove up in the dark... there was a quick mental debate on which field of flowers to go to, but knowing I wanted to have Mt Hood and the sunrise in the background led me to the main field. After seeing the crowds in the dark, I knew in my head that I wanted to just go shoot on my own... looking for the most complete rows, I stumbled around in the muddy wet fields, trying my best to not crush the flowers. Once the sun started to peek out, I was able to fully setup a composition how I wanted it… and truly feel was lucky to witness the symmetry of beauty as the sun rose and know it was well worth the effort of crawling in the mud.